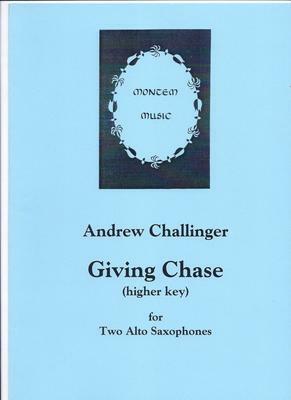 Giving Chase was written for advanced students so should represent a challenge to most players. There are some top A's and plenty of quick notes but the hardest thing is to hold the tempo through the overlapping rhythmic patterns so that neither player gets further ahead or behind than intended. Should be fun for those with the necessary technical facility. What do you want to know about Giving Chase?